At Calf Hey we are dedicated to providing you, the customer, with a self adhesive labelling service that is second to none. From initial contact to the delivery of your labels, we do everything possible to make dealing with us a pleasant experience. CALF HEY IS A TRADE ONLY MANUFACTURER OF HIGH QUALITY SELF ADHESIVE LABELS. Calf Hey Design operates the Hotfoil and Thermal processes. Calf Hey Rotary operates the Letterpress and Digital processes. Each of these facilities operates with their own dedicated team, specialising in their own particular range of production. However, they are sister companies located in the same location and work together on projects to ensure you receive the best price and product to match your specific needs. 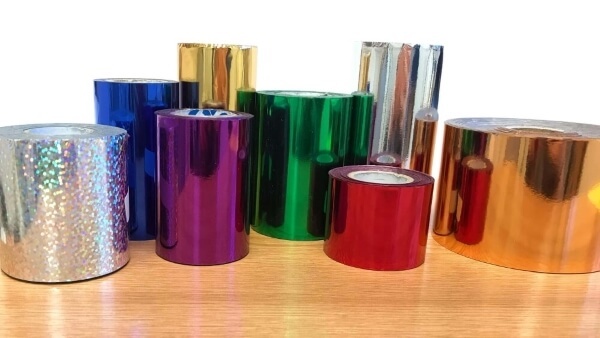 Printing with a wide range of coloured foils is our most commonly used process due to its high quality, cost effectiveness and ability to produce labels in any quantity. Thermal Printing requires no printing plates. 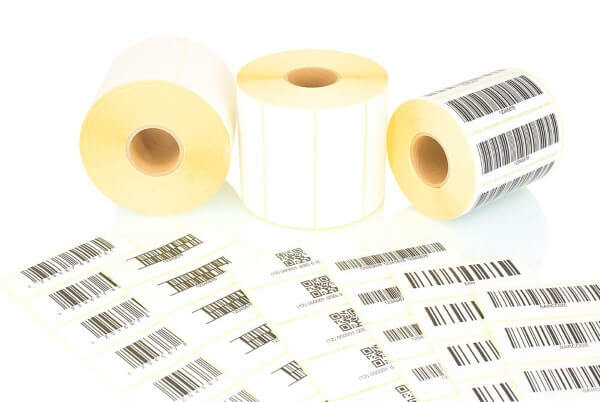 Ideal for consecutive numbering and barcoding in any quantity. 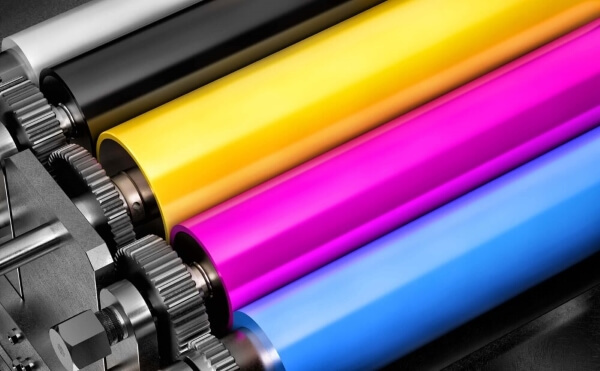 Ink printing is best suited from medium to higher volume runs and also offers the ability to match to Pantone colours and print halftone screens in up to 6 colours, including full colour labels. High quality, long life full colour labels without the need for originations. Special and intricate shapes die cut without the need for purchasing cutters. Very cost effective. What makes Calf Hey second to none? 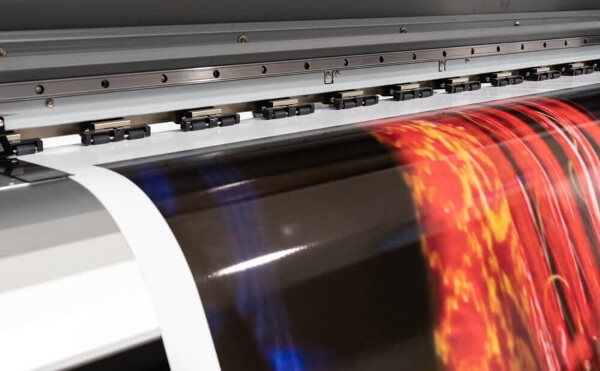 From artwork tweaks through to full label design, we have invested in the most up-to-date software and equipment to ensure the best service possible. Our fully experienced and friendly office team are on hand to offer you advice, help and technical information. Every enquiry is looked at individually to ensure that we offer you the best price and production method for every job. Having so many varied processes and machines at hand gives us the widest variety of solutions, to ensure you, our customer, are provided with the correct product for your clients. Receiving your product on time is crucial to ensure that your customer is satisfied. At Calf Hey we understand this and have built a business on service. That is why only thoroughly vetted national parcel distributors are engaged to deliver your product. We can deliver direct to your customers if required under plain cover. Let's do it old school - we will send you a FREE sample! Our current brochure is packed with information about us and our products. If you would like a brochure, please let us know and we will put one in the post straight away. The brochure is included as part of our continually updated sample pack. 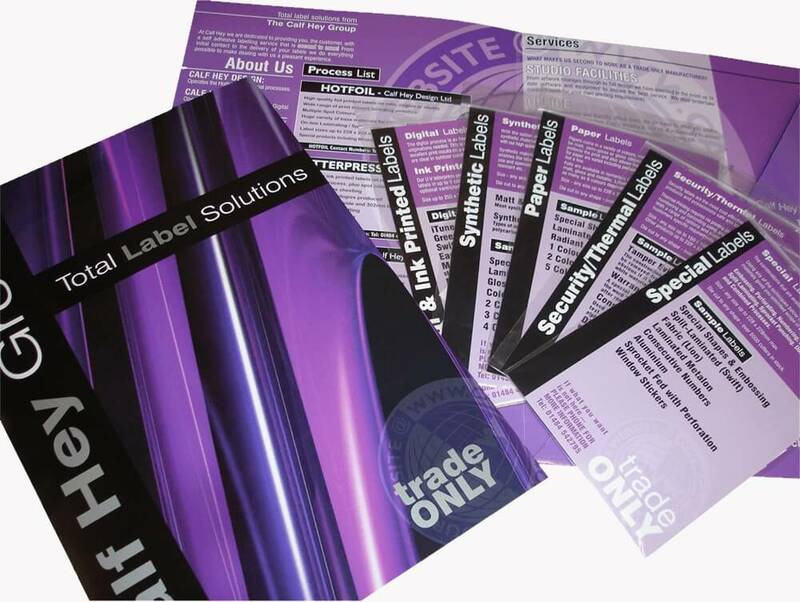 The Sample pack contains a wide variety of labels that are manufactured by the Calf Hey Group. They include Plain, Printed and Specialist Labels such as 'Split-Lam' or domed labels.